I remember reading Karan Bajaj’s books many years back. Sometime in 2009 i think. Keep off the Grass was a fresh campus story, unlike the wave of the other semi-autobiographical love stories in campus books that did the rounds back then. I also read his second book after the first one, and was mildly disappointed. Whoom! Karan vanished since then. He was not on the blogosphere, and no book released for long. And then, sometime last spring, i saw a Facebook ad with Karan, and immediately got reading. Coming up to his life, and his new blog made it feel like meeting a long lost friend. Then i got to know about the new book, and immediately knew i had to read it. More so with the subject of the book being in my realm of interests – spirituality and finding self. 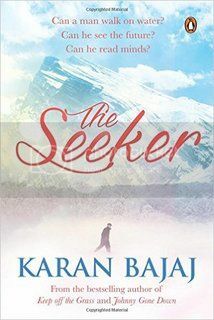 The seeker (published as “The Yoga of Max’s discontent”), like the title of the book is the story of Max. A hot shot investment banker who is confused in life and his quest for the inner self takes him on a tour of a lifetime. After a devastating event in new York, Max is inspired to travel to India to seek the inner truth of life and sets off on a journey. The Himalayas are the obvious suspect and Max lands up at the foothills. Without a plan, nor practise, Max endures a near fatal trip to the hills and then realises that the way to ultimate truth is not so straight forward. The story now takes him to Mumbai, the underbelly of the country for a plot which seems force fit to fill in a force fit physical intimacy scene. A quick chapter in Mumbai and then the hero moves on to a non descriptor location somewhere in Tamil Nadu in Southern India. This is where the plot thickens up. The daily struggles in the ashram, ripping off the basic beliefs and shaking up the core necessities we all take for granted is a revelation. Here, with the fear of being a spoiler, i need to mention the part where Max has an argument with his Guru regarding the food sharing part and then has a bigger realisation of how the same food can be used for a larger purpose. The entire plot in the ashram makes one feel as if you are physically present there while this was happening. It manages to transport the reader to a different world altogether. The climax is where the book takes a peak and ends on a high with the basic simplicities of life explained. This was the KungFu Panda moment, where the reader realises the truth lies within ourselves. Would not dwell any deeper to avoid spoiling the experience of reading it. Karan’s writing is lucid, and following his blog makes one feel how sorted the person is. The fact that this book was written on a sabbatical makes it all the more inspiring. Overall, a must read for anyone even faintly interested in the funny thing we call, Life.